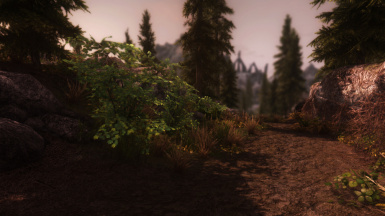 The original OrganicENB was based on The Wilds ENB preset by Lsiwora. 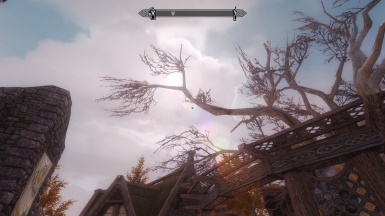 Climate of Tamriel and Vivid Weather mods supported. +- Configured the enblens outdoor intensity be gradually zero at mid day. +- Disabled the enblens option by default. 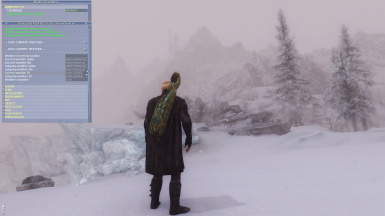 Please enable it from the ENB gui or edit the enbseries.ini file. +- Adjusted the ToneMappingOversaturation setting for the white blinding sun. +- Added the Wilds v3 Bloom exterior with the brightness and constrast controls. Enabled it on the Skysan option. +- Simplified the BRNITE controls. 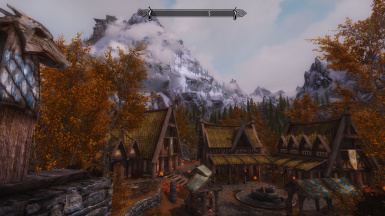 +- No need to enter the screen resolution: using the ENB ScreenSize. +- Added the Wilds v3 Bloom internal only option, and enabled it on all download editions. +- The Palette bmp usage is disabled when the Wilds v3 Bloom is enabled. Thank you all for taking time to download and endorsing this mod. 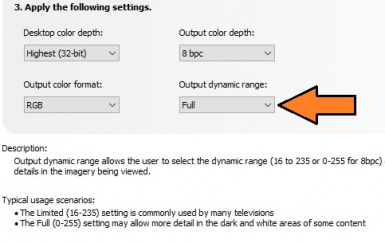 If you are using the HDMI connection, please enable the "Output dynaic range" setting to "Full". Here's the Nvidia Control Panel window on how to set to Full. 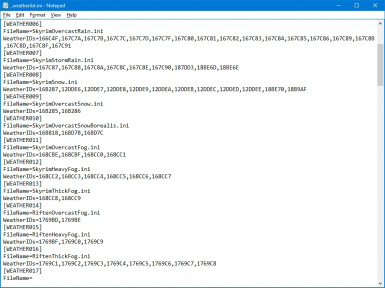 Here's the AMD Radeon Additiona Settings window on how to set the Pixel Format setting. 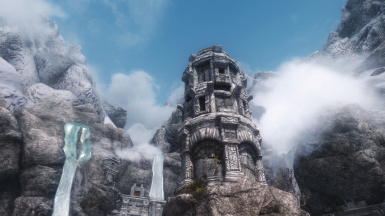 Pick either Vanilla, Climate of Tamriel, or Vivid Weather edition download. 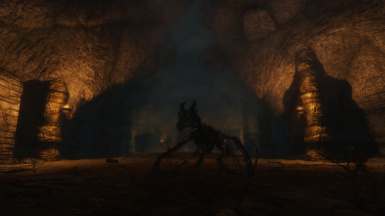 Some reported the "Mod Organizer" has its own Skyrim.ini and SkyrimPrefs.ini, so please make sure the right ini files are tweaked. I configured this preset to see a soft skin glow especially at night. 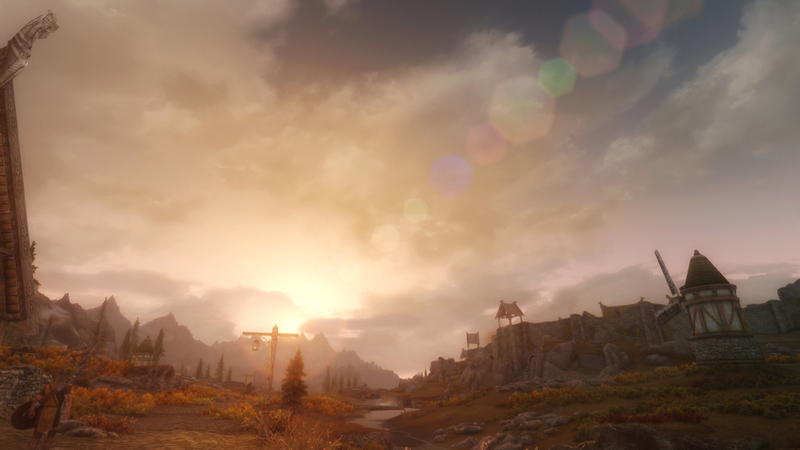 If this is too much to your taste, please try raising the SubdermalDiffuseSaturation value under the SubSurfaceScattering section on the ENB GUI.For glowing children face, try "SUBSURFACE SCATTERING PATCH" by mindflux. 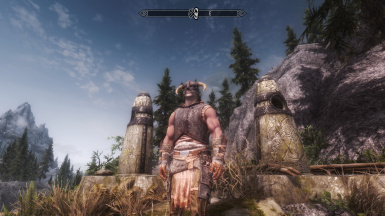 The New Children mod has a descent "normal" map that can correctly show the skin tone. All options will require the "00 Core Files" option installed first. If you are manually installing, please do not mix files from these two directories. Each directory has the Midrage PC option and the Budget_PC option. The Skysan/MAIN option is what I'm using, and it has less saturation and brightness for my preference. The MAIN option has been tuned with the Nvidia GTX 1070 for the HQ visual, so this option has the visual quality tuned for the performanace. 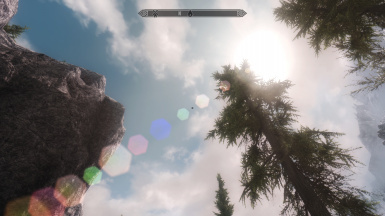 The Ambient Occulusion (SSAO) and the ENB extnerl reflection are disabled. 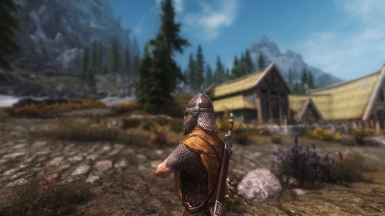 For those with less powerful PC, this option can boost fps while still give you this mod's look. 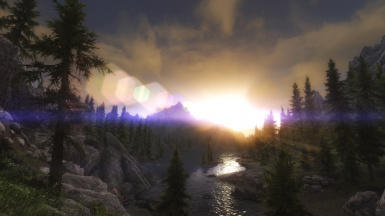 This option disabled the following fps hungry ENB features such as Skylighting (richer darker shadow), ENB_Water, VolumetricRays, and Mist. Please use this option only if you PC struggles around mid-20fps or less than 30fps outdoor. 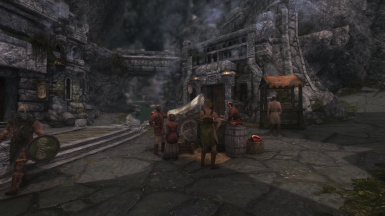 Blacksmithforge water fix by hexaae to see the ENB Water on all blacksmith forges. 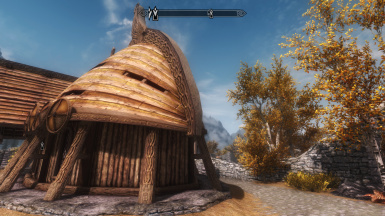 Make sure my horse trough mod ESP file is activated after the hexaae's mod. 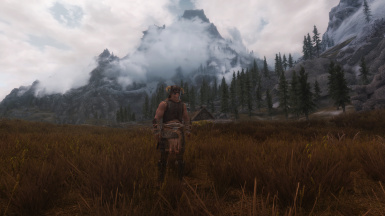 Grass on Steriods: This mod can boost outdoor performance by lowering number of grass to render while still shows the same grass volume. 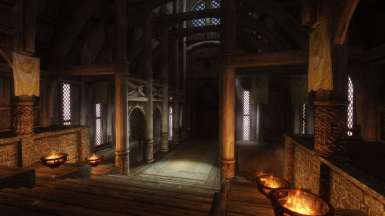 Skyrim Startup Memory mod: I highly recommend this mod if you've been experiencing the Infinite Loading Screen (ILS) or CTD at mostly entering a cell that may have been modded like Breezehome. I've using this mod with that mod's default settings, and I haven't experienced ILS or CTD a long time. 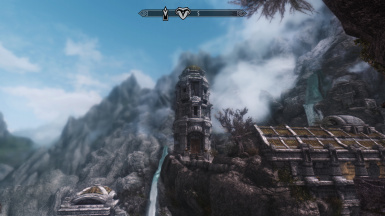 It won't get rid of CTD completely, but it helped tremendously to stabilized Skyrim. SKSE added this with v1.7.0, and you must manually create the skse.ini file with the SSME configuration to enable it with SKSE. 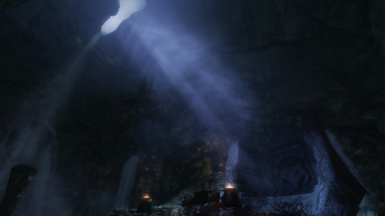 Enhanced Lights and FX by anamorfus "00 Core Files" recommended. 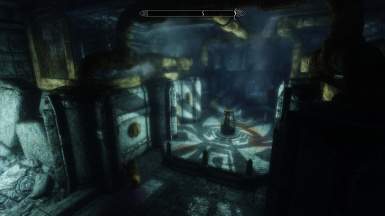 The other additional files may make Skyrim look too dark. For glowing children face, try "SUBSURFACE SCATTERING PATCH" by mindflux. 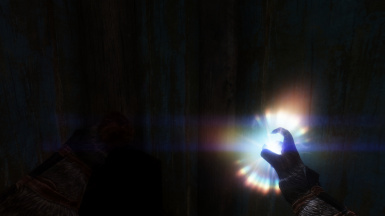 Also try his PARTICLE PATCH for ENB. 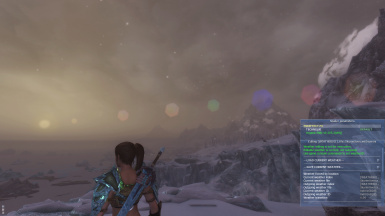 JawZ smooth out color band sky mesh: JawZ has smooth out the color band distribution on the sky/atmosphere.nif mesh file as much as Skyrim allowed. 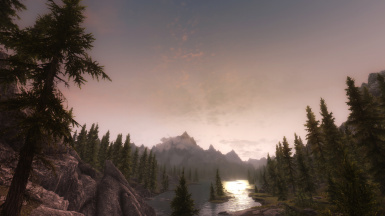 JawZ has the ENB v0.262 and above specific atmosphere mesh file, so please use the correct download. 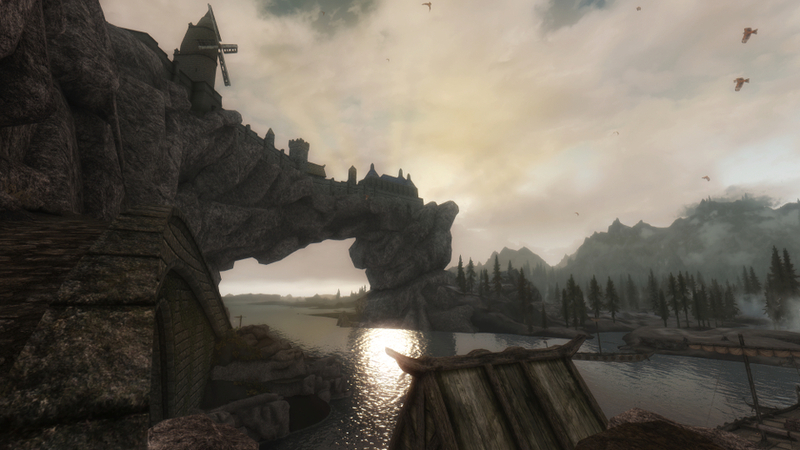 Some reported a complete black sky could shown if the older mesh was used with the latest ENB.